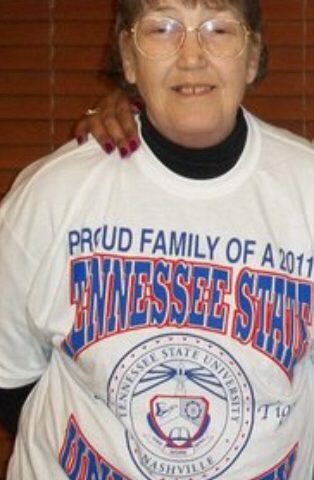 Doris Elizabeth Monk of Lewisburg, Tennessee, passed away at NHC Lewisburg on Sunday, February 3, 2019; she was 72 years old. Mrs. Monk was preceded in death by her husband of 54 years, Douglas Eddie Monk, Sr.; brother Jamie Akins; and sister, Margaret Ann Williams. She is survived by son Douglas Monk (Beverly); son, Richard Monk; son, James Monk (Darlene); sister Mary Diane Miller (Chuck); grandchildren, Danielle Monk, Noah Davis, and Gracie Davis; brothers Waymon Williams, and Edward Williams; sister, Deborah Keeling; numerous nieces and nephews; and Nikah the cat. Visitation will be Wednesday, February 6, 9:00 – 10:00, with a Celebration of Life beginning at 10:00; all at Harpeth Hills Funeral Home. MY LIFE WAS TRULY BLESSED, THE DAY YOU CAME INTO MY LIFE, TWO YEARS AGO. I ALWAYS FELT PURE JOY AND HAPPINESS IN YOUR PRESENCE. I HAVE SO MANY FOND MEMORIES WITH YOU, (POKING ME WITH THAT CANE OF YOURS 🙂 ). YOU WILL LIVE FOREVER IN MY HEART. I WILL SEE YOU AGAIN ONE DAY DEAR FRIEND. UNTIL THEN, ENJOY THAT NEW BODY THAT YOU ARE RECEIVING FROM OUR FATHER! I WILL LOVE YOU AND MISS YOU ALWAYS. Words can’t express how much I miss you and your stories about the cat. All that I think of is that you are no longer in pain and you will never have to go on dialysis. I miss you telling me that you loved me and that sweet kiss on my cheek when we said goodbye. I will always love you and miss you. Denise, Kayla and myself were telling each other our funny stories about the first time we met you. You were a blessing to me and I will never forget you Doris Monk. God has you now so I can only be happy for you until we meet again. Thoughts and prayers for the family.